Enviro Masters – For Professional Care & Superior Service! 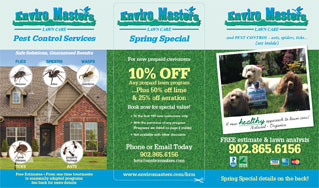 At Enviro Masters Lawn Care we use effective natural and organic products to give you a healthy, lush, deep green lawn. For weed control, insect control, and grub control we apply natural products such as Fiesta, made from chelated Iron to kill weeds. For insect control we use pyrethrins which come from the Chrysanthemum plant and for grubs we use living microorganisms called nematodes. Our fertilizers are custom blended from the highest quality ingredients including phosphorous free and organics. 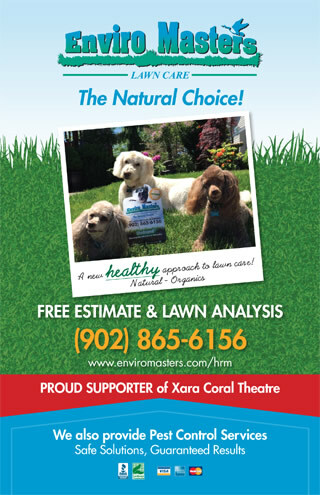 Enviro Masters Lawn Care has been operating in the Halifax area for over 12 years. See below for what our customers say about our service then please complete the form below for your FREE estimate. We care about your lawn, your home and your property!